Unfortunately, most of our lectures are not on glaciers, but in BNR 314. 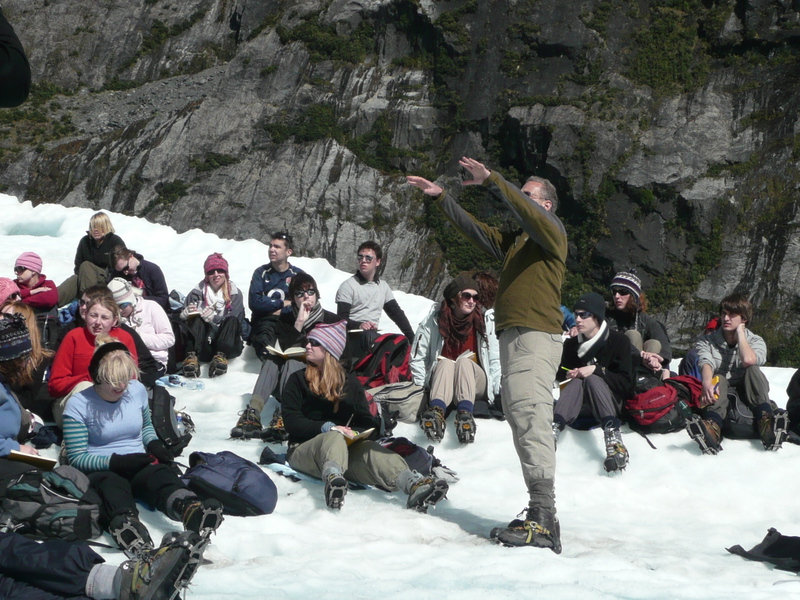 This is my former colleague, Neil Glasser, lecturing and arm-waving on the Franz Joseph Glacier, South Island, New Zealand. Labs are on Tuesday and Thursday from 12:00 to 2:00 and Friday from 10:30 to 12:30. You are welcome to attend ANY of the lab sessions on Tuesday, Thursday and/or Friday, but priority for seating is given to those registered for that session. Lab attendance is not mandatory, but highly recommended to get assistance from Shannon and/or your peers. Furthermore, in the first 15-30 minutes Shannon reviews grades from the previous weeks labs, gives an overview of the current lab, and provides helpful hints and tips to do well on the current lab. For information on Computer Labs see: http://www.cnr.usu.edu/quinney/htm/labs. All software we use will be available for download and installation on your personal computers. However, if you wish to use the lab facilities (either QL304 or QL306) outside of the scheduled lab, please see Lab Calendar for lab hours. If you need access to ArcGIS and SAS these programs have been installed in two of the centrally operated computer labs across campus. The labs are in ENGR 305 (third floor of the ENGR building), as well as in the University Reserve Graphics Labs (located along 700 East North of the Fine Arts Center). Just a note about the UR Graphics Lab, that lab is specific for MAC computers, however they run a program that will run Windows. ArcGIS is only on the Windows "side" of the computer. For the last 5 weeks of the semester, the project class will meet in QL 306(that's right, next to Aggie Ice Cream) on Tuesdays and Thursdays from 10:30- 1:00ish. Some days we'll only meet for an hour, and all the scheduled lab sections are cancelled. No mandatory content will be covered outside of the 10:30 to 11:45 time slot. Optional lab and help sessions will run from 11:45 to 1:00ish.